동해안 청초호수 근처에 있는 청동기시대 유적으로 기원전 8세기경에 사람이 살았던 집터와 무덤들이다. 1992년 7채의 움집터와 고인돌무덤 2기를 조사하였다. 집터는 생토 풍화암반층을 40∼60cm 길이로 파내고 바닥에 고운 진흙을 얇게 깔아 만들었다. 규모는 동서로 긴 네모꼴로 크기는 약 23∼76㎡ 로 밝혀졌다. 이것으로 당시 사람들이 약 7∼23평 크기의 움집에서 살았다는 것을 알 수 있다. 출토 유물로는 많은 석기와 토기가 나왔다. 특히 고인돌에서 찾은 부채꼴 모양의 청동도끼(선형동부)는 함경남도 지역에서는 나온 적이 있으나, 강원도 동해안 지역에서는 처음 나와 이 지역 선사문화 연구에 큰 도움이 되고 있다. As prehistoric ruins of the Bronze Age, this is a dwelling site where mankind lived around the 8th century BC. 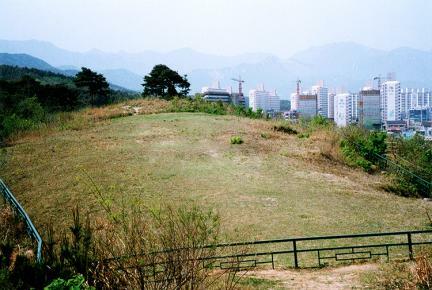 Many materials suggesting the state of living during that time were found at these ruins near Cheongcho Lake on the East Coast. According to research, contents of the seven dugout sites and two dolmens used as tomb were found. During this time, the dugout house was made by spreading fine clay in thin layers after digging out the surface of the weathered rock layer 40 - 60 cm deep. These dugouts were found to have total area of 23-76 square meters, with a square plane with a slightly extended east-west side. 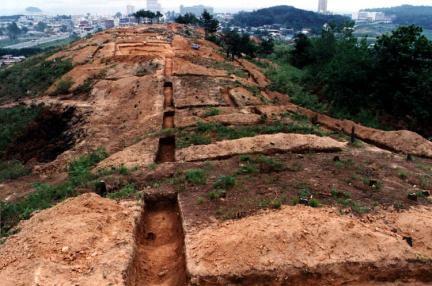 All these data suggest that, at that time, mankind lived in a dugout measuring 7-23 pyeong. Furthermore, many stoneware and earthenware pieces were found at this site. In particular, the bronze axe shaped like a fan and found in the dolmen contributed greatly to studies on the prehistoric culture of this region because it was never before found in the East Coast of Gangwon-do. These ruins are a very important historical element in studying the actual living state during the Bronze Age in our country.